Objective: To investigate the specificity of rapid eye movement (REM) sleep eye movement measures in schizophrenics, depressives, and nonpsychiatric controls. Study Participants: Volunteer sample of male veterans who met Research Diagnostic Criteria (RDC) for schizophrenia (n=21) or major depressive disorder (n=24), or male veterans recruited from the community with no history of psychiatric illness (n=13). Patients with a concurrent RDC diagnosis of alcoholism were excluded. 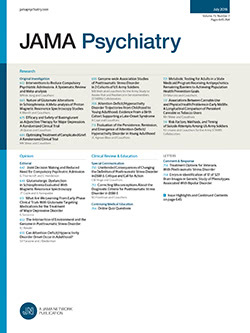 After data collection, three schizophrenics, two depressives, and one nonpsychiatric control were eliminated because of two or fewer REM periods on either of the two recording nights. Main Outcome Measure: Computer-detected total night and within-night measures of REM sleep eye movement density, ie, the ratio of eye movement counts to stage REM minutes. Results: Using a 95% confidence interval, schizophrenics, depressives, and nonpsychiatric controls did not differ in total night or within-night measures of eye movement density. Within nights, eye movement density increased across REM periods in the schizophrenics and nonpsychiatric controls; the depressives showed a flatter withinnight distribution associated with their older age. Conclusions: A broad range of REM sleep eye movement densities characterize both schizophrenics and depressives and substantially overlaps the normal range. Adnormalities of REM sleep eye movement activity should not be considered a biological marker for affective illness.